Thank you for playing the Dragon Ball Super Card Game. Time Control Chronoa, a new card from Series 4 -Colossal Warfare- was revealed on the official site on June 8th 2018, and there has been a far stronger response than we anticipated. There’s also been some strong criticism of the way a specific card (Unwavering Solidarity Shugesh) has been dealt with. Before we release the Colossal Warfare designer’s note article, we thought it wise to explain our intention when designing the card. Following the release of Series 3, yellow became quite popular as a result of powerful yellow Extra Cards, which led to Unwavering Solidarity Shugesh seeing more play than we anticipated. 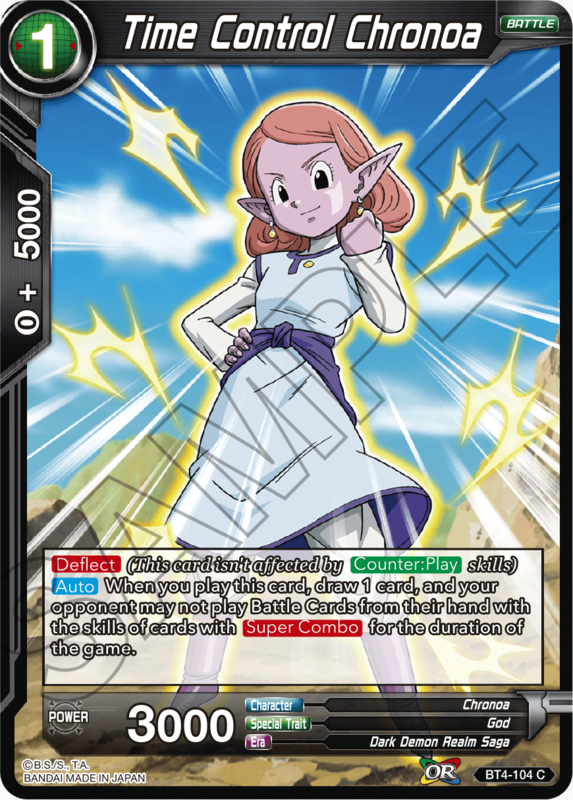 Shugesh is an extremely powerful card that can be utilized for offensive and defensive purposes alike, and playing against it can be extremely difficult, particularly for new players. More Saiyan cards are coming in Series 4 and beyond; taking the current decks and meta into consideration, we recognized that, with the new Saiyan cards in Series 4, it may once again be possible to create decks capable of winning on turn 2 or 3, and felt it was necessary to take steps to mitigate that possibility. Errata requires players to effectively substitute the text on a card, creating confusion and other issues. In emergency situations, we’ve considered issuing errata, but we believe designing cards to serve as counters is the better choice. Ultimately, we decided to print a card with an effect that could activate under any circumstances to limit Shugesh. We’ve seen many comments from players arguing that the effect limits the game’s overall design space, but it also allows us to design more and different Saiyan cards that cost 3 or less. We want to apologize to all of the players who use Unwavering Solidarity Shugesh as the core of their decks. The reveal of Chronoa must have come as quite a shock, and for that, we can only ask for your forgiveness. However, there are no restrictions being placed on Shugesh himself, so you’ll still be able to use him depending on your opponent’s deck. Our intent with Time Control Chronoa was to reduce the number of top-tier decks running Unwavering Solidarity Shugesh to create a more balanced environment, draw attention to other non-yellow Leader and Battle Cards, and allow players to fesiably play a wider variety of deck archetypes. Everyone on the Dragon Ball Super Card Game team is working hard to create a product, play environment, and tournament system that will satisfy you, the players. Thank you for reading this, and we hope you’ll bear with us during this brief period of readjustment.